Wash berries and discard any mushy or rotten fruit. Stir together berries, sugar, rosemary, cinnamon sticks, and water in a saucepan and bring to a full rolling boil that does not cease when stirred. Continue to stir and let the mixture boil for 2-3 minutes. Reduce heat to medium and allow the mixture to cook for an additional 10-15 minutes, or until it does not slide off the spoon when raised above the pan. Prepare a water bath, and sanitize jars and lids (soapy water or dishwasher). Remove cranberries from the heat, and push through a sieve (a pasta strainer will work too) into a medium bowl. Discard the skins, rosemary, and cinnamon, which will be left in the sieve. Carefully ladle the jam into the clean jars (2 bags made 2, 8 oz. jars for me). Wipe rims, and screw lids on ‘finger tight’. Process in a boiling water bath for 15 minutes, adjusting for altitude. Make sure the jars are covered by at least 1” of water during this process. Remove from the water bath once the jars are fully processed. Use twine, fresh cinnamon sticks & rosemary to add a festive tough to the gifts. 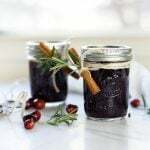 Spiced Cranberry Jam was originally written by Leigh Anne Wilkes at https://www.yourhomebasedmom.com/spiced-cranberry-jam/.